This is a Civil Defense Earthquake update message for 6 p.m., Saturday April 13, 2019. The Pacific Tsunami Warning Center reports no Tsunami from the earthquake. Reports throughout the island report damage along some roadways. 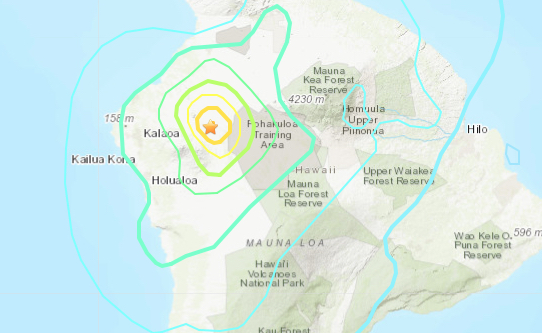 Hawaii Volcanoes Observatory reports no activity or change in status of the volcanoes on Hawaii Island. Check utility connections such as electric, gas and water for damage and shut off main if damage is observed or suspected. Debris maybe in roadways drive with caution. Rock fall Mamalahoa Highway south (Route 11) near mile-markers 100 and 110 in Kona. HELCO crews are working on restoring power to the Waikoloa area to about 3,300 customers. You will be notified of any changes that affects your safety.